Since the merger of the Wii-Network branch in 3.5-2143, Dolphin can now use the Nintendo WiFi Connection to play Wii games online. Since it uses the official Nintendo platform for Wii online gameplay, Dolphin users can play online with not only other Dolphin players, but with real Wii players as well. For copyright reasons, some of the files required to access the Nintendo WiFi Connection cannot be distributed with Dolphin and have to be obtained by the user. As of May 20th 2014, the Nintendo WiFi Connection has been terminated, and as such Dolphin can no longer connect to it. However, these instructions apply to all online services, such as custom WiFi Connection servers and the Wii Shop Channel, and still applies to them. If using a custom servers, see their documentation for more details. Download and extract NUS Downloader. This program allows you to obtain various system files directly from Nintendo's official servers. Run the program. 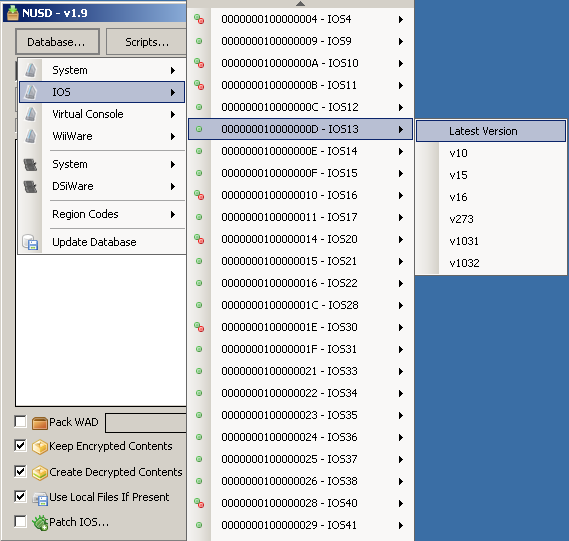 Check the "Create Decrypted Contents(*.app)" box then select the latest version of IOS 13: Database > IOS > 000000010000000D - IOS13 > Latest Version. Click the download button to proceed. It will download the certain Wii operating system files from Nintendo. Once the download has completed, browse to the newly created directory under its executable directory: \titles\000000010000000D\1032\. Make sure that the 00000011.app file exists; it's the only file required for this guide. If you are using Linux or OSX, compile extract_certs.cpp (in C++11 mode) and use this to dump the certificates. Copy these three PEM files to the %userprofile%\Documents\Dolphin Emulator\Wii\ directory. After this is done, you should be able to access online services with Dolphin! Enjoy.